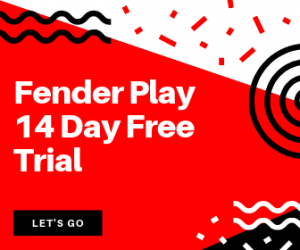 If you’re thinking about learning the guitar and have a few questions, or if you are a guitarist and have been wondering a few things yourself, or even if you have a guitarist in your life and want to know more about a certain thing they’re doing, then we hopefully can provide some help and shed some light on your queries. 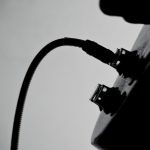 We’ve scoured the web, online resources, forums and social media to get to grips with the questions being asked around the guitar, so you can have an ultimate resource to look back to. Some are funny, some are really helpful, and others are downright strange. Either way, we hope you enjoy this one! 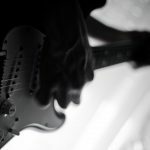 Does playing the guitar hurt? Who are we to lie to you! It isn’t that playing the guitar hurts, it’s just that beginners have not built up any calluses or toughness on the tips of their fingers. A callus is hard skin caused by the resistance of the strings, which is a primary reason why many beginners tend to use a nylon string guitar. These classical guitars have much softer strings compared to metal string electrics and acoustics, and are therefore an easier option if the player is worried about the initial pain of building up a callus with a standard metal string guitar. To answer this question though; yes, it can hurt for beginners, but the pain quickly subsides as players build up that all important hard skin on their fingers. Why do guitarists wear headphones? You’re probably asking this question having seen players like Paul Gilbert live. Paul, and many players like him, always seem to be wearing headphones when playing live. Also, guitarists in general just seem to be wearing headphones when practicing, so why is this? Headphones allow guitarists to hear themselves perfectly, which is an incredibly useful position to be in (especially when playing with a live band). Many guitarists new to live playing may struggle to hear their tone through the monitors as they’re not used to a full band live setting, therefore headphones offer the opportunity instead. 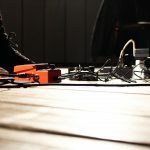 Why do guitarists and musicians stand on rugs? Rugs and carpets prevent monitors, amps, and equipments from slipping on the stage. It’s important for standing musicians to be stood on a comfy surface. The rug provides the freedom to move freely around the stage, via a flat and safe surface. Okay, point 5 is a bit of fun. 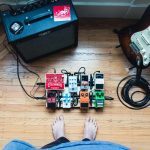 But who doesn’t think that the vintage rug coupled with an extensive pedalboard looks nothing shy of awesome?! Who is the best guitarist to have ever lived? Many guitarists would argue that this is none other than Mr. Jimi Hendrix. He paved the way for modern guitar music by fusing vintage blues, jazz, psychedelic rock and a bit of everything else to completely transform the way we play guitar today. His approach, style, timing and techniques were nothing short of revolutionary. Drop a comment below if you have a different thought! Why do guitarists fingers bleed? Again we refer back to the point about calluses. Whether you’re a seasoned player who plays past the capabilities of the hard skin, or are a beginner who pushes past the pain, there will be a breaking point of this hard skin (or lack of, if you’re playing for the first time). This is rare though, so if bleeding fingers are a worry to you, they shouldn’t be. Just don’t push past extreme discomfort and you’ll be fine. Why do guitar players use a capo? Capos allow guitar players to play in a different key. This is done by raising the pitch of the instrument, which is achieved by the pressure the capo exerts on the neck of the guitar. Think of it as a barre chord, played from that position onwards. Why do blues players use a slide? Slide guitars were made popular by blues players from the early 20th century, who would combine their slides with a parlour guitar for that acoustic tone we all know and love. A slide is primarily used to achieve this unique blues tone, which was perfect for players who would want a blatant and deep vibrato effect, across as many strings as possible. This is very hard to achieve without the use of a slide. Why do guitarists move their mouths when playing? Many guitarists find their movement stiffened by the guitar. That is, if the player is not free to move, then the mouth interprets the freedom of movement which the body wants to achieve. Particularly when soloing, a guitarist will be thinking of the next few notes ahead, perhaps even subconsciously. The mouth movement may be mimicking the upcoming notes, or simply keeping time or on the right track for the movements ahead. The mouth movement is an additional form of expression, linked to the notes being expressed on the guitar. Can anyone learn to play the guitar? Yes, yes and yes again! For specific questions head to our contact page and we will be happy to point you to helpful resources. We will be updating this question a little later on in 2018 with resources requested by our readers and those of you who are interested in learning to play guitar but don’t know where to start. Why do guitar players have so many guitars in their collection? Freedom to play, and a guitar to suit each situation. One song may call for a vintage acoustic blues tone, whereas another may need a searing electric guitar solo. The more guitars in a collection, the more options there are when an opportunity arises. What are frets on a guitar for, and why do guitars have frets? Frets are used to represent semitones, with most guitars having frets ranging between 18-24. A primary reason for guitars having frets is that each note is much more solidified. Compare this to notes on a violin, which are much more fluid. Additionally, chords would be almost impossible without a fret solidifying each note! We hope this roundup of questions we’ve seen already in 2018 help to shed some light on any questions you may have. If there’s a particular question which is bugging you, please feel free to comment below and we will add it to this post with an answer.